This article does not concern the bug ‘The Elapsed event of the System.Timers.Timer class is not raised in a Windows service’ which is dealt with seperately on the Microsoft website – occurs when a system.timers.timer is stopped and then started again. Some time ago I wrote an application to process auto-generated .TSC (tab delimited text) files and send batches of emails based on the contents – worked very well but I had to remember to run it every day. Decided to make it a service to avoid delays in sending the mails but some trouble getting the processing routines to fire on a timer. Forms Timer does not work with Windows Services. A bit of research on the web led me to http://support.microsoft.com/default.aspx/kb/820639, which advised to be sure to drag the timer component from the Components tab instead of the Windows Forms tab. Followed these instructions but the component still created a system.windows.forms.timer object, just like it does from the windows forms tab. This will not process timer events in a Windows Service, so the code never executes. 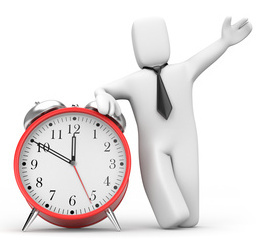 In a Windows Service it’s necessary to use the Timer_Elapsed event, not the Timer_Tick event – Elapsed isn’t available on the Windows Forms timer, only the tick event is. Surprisingly, you have to add the System.Timers Timer from the ‘.Net Framework Components’ tab by right-clicking the Components Tab in the toolbox and selecting ‘Choose Components’ – this is the one to use for a Service, either by dragging onto the designer in the IDE or in code (see end of article). The rest of the code loops through .TSC files in a specified location. 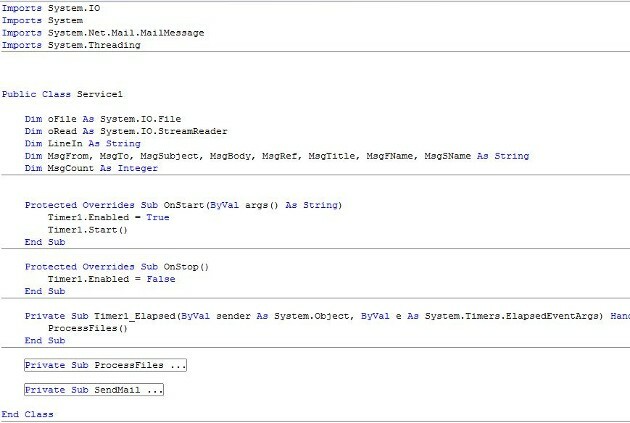 It reads each file line-by-line, builds an email on the fly from the contents and relays this through Exchange using System.Net.Mail, finally deleting each.TSC on successful completion and emailing the relevant team a status report. Update: Thought occurs… if you just want to delay processing for a period you could always just loop using System.Threading.Thread.Sleep(delay in milliseconds)…? Tagged Programming, vb.net. Bookmark the permalink. muchas gracias, con esto pude resolver mi problema. Thank you for saving me the torture of burning out my processors trying to solve this one. Professor Falkner will be so pleased once I achieve sentient…ness. Worked all weekend trying to get the forms timer to work, thought I was going crazy. lol…I see the website name is Faulkner…no disrespect.